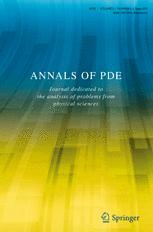 The principal goal of this journal is to publish articles of the highest scientific value concerning partial differential equations of broad, pure and applied interest. A second, but no less important goal is to facilitate a better awareness of progress made in various fields by researchers in all areas of PDE, highlighting the common core of ideas of the discipline. In this spirit, the editorial board will emphasize the importance of comprehensive introductions, accessible to a general scientific audience, and of timely, up-to-date review articles. The editors intend to offer prizes for the most important contributions and to revive the old tradition of generating prize competitions around well-defined topics.